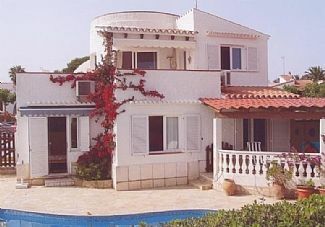 Super Villa with Private Pool,perfect for families ,Sleeps 8/9 (4 Bedrooms). The Villa has 2 double and 1 twin bedroom & 1 twin/triple bedroom on the ground floor, together with 2 shower rooms -1 en-suite. The 2 double bedrooms have air conditioning and patio doors leading to the swimming pool area, the 2 other bedrooms both have ceiling fans,1 has a wash hand basin.The patio area is spacious with ample seating and sunbeds,there is a covered dining area with Barbeque downstairs next to the pool ,dishwasher, fridge and washing machine. Upstairs a circular sitting room with Sky TV and CD/DVD player,a fully fitted kitchen with modern appliances, large terrace with table & chairs to enjoy the wonderful sea views. En - suite to bedroom 1 with large walk in shower,wc. Separate large shower room with walk in shower and wc. Both Bathroom and beach towels are provided. A circular living room with 1 three seater sofa, 1 two seater sofa and 2 chairs ,Freeview Sky TV and CD/DVD player. Bookcase full of books for you to enjoy. The covered dining area downstairs has a 2 seater sofa and chairs which are great to relax in. Both upstairs in the kitchen & also outside on the terrace. Large fully fitted kitchen with granite worktops,large fridge/freezer,electric hob,oven,kettle,toasterand large selection of kitchen equipment. Golf can be played at Son Parc approximately 30 minutes drive. Notes on accommodation: The two double bedrooms have air-conditioning, the other two both have ceiling fans. Bedroom 1 has patio doors to the covered terrace and bedroom 2 has patio doors to separate terrace overlooking the swimming pool. Cots and High Chairs can be arranged at extra cost. Outside: The Villa has two patio doors leading onto the swimming pool area, which is spacious, with ample seating and sun loungers. There is a fabulous covered dining area with dining table and chairs and sofa for a more relaxed atmosphere. Downstairs there is a dishwasher, washing machine, fridge, a charcoal & gas barbecue. On the first floor next to the kitchen there is a large partly covered terrace, with table & chairs. There are stairs leading up to another patio with magnificent views over the sea and the complex. Off road parking for 3 cars. The pool is maintained twice a week. Cleaning / Towels / Linen / Maid service: Towels and all linen are provided (including beach towels) . Further housekeeping services can be arranged. My wife and I started going to S'Algar when we were both kids back in the 70's. We have never stopped going and it probably works out at every other year. Our kids ( 17 & 12) have been numerous times and they love S'Algar and are never bored. This villa is beautiful, well appointed and guests want for absolutely nothing. It was spotless when we arrived. Rachael the owner was fantastic to deal with and the entire booking process was quick and painless. Would we stay there again? Absolutely!! Fantastic villa.Was just as said on advert. Very clean on arrival. Has free wi-fi which is a definate must for the kids!! Perfectly placed on resort for all amenities.Pool was great fun. Would definitely recommend to all. .
S'Algar has a fantastic scuba diving centre which has courses running throughout the summer and can be booked upon arrival. The villa is situated ideally 5 mins from the sea front, where there is a sunbathing area and steps into the sea for excellent snorkeling and home to the well known S'Algar Scuba diving school.Several stunning beaches 1 within walking distance at Alcaufar and others only 10-15 minutes drive away. Mahon airport is only 15 minutes away. As Mahon harbour is only 15 minutes away it really is a must to see the magnificent boats that come during the summer or just to enjoy what the restaurants have to offer. Regular buses from S'Algar run to the main harbour however if you want to explore and see what the island has to offer then hiring a car is essential. Within S'Algar there is a bakery,supermarket and numerous bars and restaurants all within walking distance. The city of Mahon is approximately 15minutes drive away.There are wonderful buildings and shops there, together with the port which is around 5 Kilometres long where boat trips are available. It is well worth a visit! Within S'Algar there are 4 astroturf tennis courts 5 minutes away ,together with an artificial Bowling Green, Table Tennis, Pool table, Boules and Chess Bar enough to keep all ages entertained. 5-10 mins drive away is the Saint Lluis which has numerous shops ,medical centre,cash points and chemists. The trotting races in Saint Lluis are well worth a visit.